The designer, by definition, is open-minded, curious, and empathetic. As a designer, your vision, your approach, and your statements impact how products and services are going to be used to improve people’s lives. 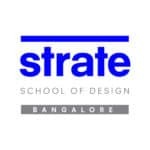 Strate is a unique design school that nurtures your talents as a designer by offering state-of-the art designing courses in Bangalore. The Master in Design program from Strate enables you to seek, innovate, design, and give shape to your ideas. It is typically an integrated design course, combining all facets of a Bachelor’s and Master’s degree. The Master in Design program offers five unique design courses in Bangalore – Transportation, Product, Interaction and the upcoming Space and Identity design courses. These design courses are aimed at equipping aspiring designers with the mindset and skills for a lucrative career in design. Learn to analyse the social and personal realities of our time (the notion of family, crowd management, human psychology, the evolution of man) to guide your creative process as close to human needs as possible, in the improvement of the quality of life of people. Translate your ideas into objects, services, or experiences by learning different methodologies of creation, expert drawing skills, 3D modelling, mock-ups, simulation, etc. The designer must know exactly how to structure his ideas. He must be able to describe them orally and in writing equally well. To promote your employability, there needs to be a constant association with professionals and businesses. The design curriculum at Strate includes up to 18 months of internships in 5 years, giving you adequate exposure to our professional partners. To specialize and develop skills in different business areas, you will move towards Immersive Design training while preserving your expertise as a designer. A semester abroad is mandatory in the fourth year and can expose you to global design philosophies. The Master in Design program offers students a flexible study module. The first two years of the design course are dedicated to the fundamentals of design to give you a solid understanding of what it entails. You can opt for your chosen specialization only in the third year. Click on each year to see the detailed curriculum. The 1st year of the design course is essentially dedicated to learning artistic skills, basic tools of the designer. The 2nd year of the design course extends the training from year one and starts initiations in the several majors offered, as well as in the 2D and 3D software and marketing. An entry-level internship is also required. The 3rd year of the design course starts with choosing a specialization – Product, Mobility, Identity, Space, or Interaction – while going further with transversal training. Students also undertake their first professional internship. View more details about the curriculum by clicking on the field of specialization. The 4th year of the design course starts with a semester abroad (in an internship or in a partner school) and goes on with several projects in partnership with companies. Students also start their diploma project during the year. The 5th year of the design course is essentially focused on the diploma project (thesis and project). There is also a collaborative project in partnership with business and engineering schools. It ends with a graduating internship. All the designing courses at Strate are taught by experienced French and Indian professionals. They have worked in some of the most reputed design companies and have a wealth of experience and expertise to share. This enables students to gain a global and professional perspective of design. It is mandatory for students, discover new cultures, meet other students, and learn new design methodologies. While students receive their primary training at Strate, Bangalore, they are encouraged to take up internships abroad. Internships can be domestic as well as international. The designing course includes an 18-month internship that is to be pursued across the 5 years of study. Students can pursue the internship through academic exchange with any of Strate’s 44 partner schools, finding an internship abroad, or via a study trip where they interact with foreign students. By providing these global avenues through its design course in Bangalore, Strate trains young designers to face challenges and meet the demands of the global design industry.